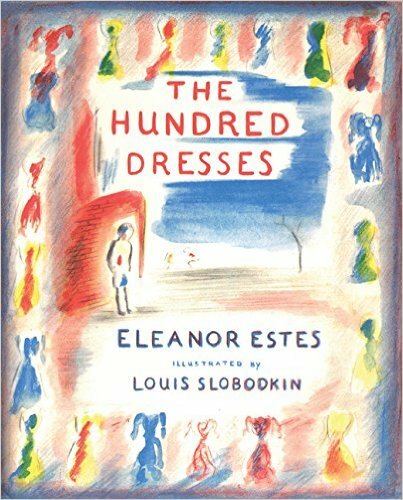 For MMGM, I am recommending The Hundred Dresses by Eleanor Estes, with illustrations by Louis Slobodkin. For Poetry Sunday, I am recommending "[i carry your heart with me(i carry it in]" by E.E. Cummings. I don't usually talk about the poem, but its uniqueness (strange formatting and no capital letters) gives it a perfect flow. Also, the title is in brackets because it is simply the first line of the poem, which has no official title. I hope you enjoy the poem! 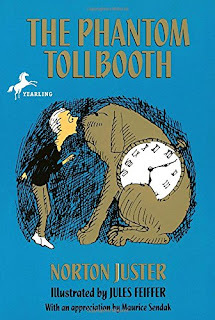 For MMGM, I am recommending The Phantom Tollbooth by Norton Juster, with illustrations by Jules Feiffer. Hailed as “a classic. . . . humorous, full of warmth and real invention” (The New Yorker), this beloved story--first published more than fifty ago--introduces readers to Milo and his adventures in the Lands Beyond. This book is one of my favorites of all time! It is a very unique book, set in a world that makes things often literal and humorous. For example, in a a kingdom of words, when the main character, Milo, asks for a light meal, the meal brought to him is a ray of light. Although the book is advanced for some readers, those who understand it will love it. In fact, the humor is there for one main purpose, which is to emphasize that, often, things that may seem boring are interesting (such as those related to learning), which Milo comes to realize. This book is very old, having first been published in 1961 (56 years ago), but it is still just as interesting. There is no plot twist, and the strange world is just that, which makes for an enjoyable, light read (although the book is not, in fact, simply a ray of light). All in all, this book is great for everyone, and, as kids read it, they may find themselves asking about things they had never thought about before. For Poetry Sunday, I am recommending "Otherwise" by Jane Kenyon. I hope you enjoy it! Next, for today's MMGM, I am recommending The Unfinished Angel by Sharon Creech. 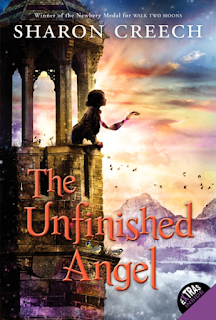 In a tiny village high in the Swiss Alps, life for one angel has been the same, well, for as long as she (or he?) can remember. Until Zola arrives, a determined American girl who wears three skirts all at once. For neighbors who have been longtime enemies, children who have been lost, and villagers who have been sleepily living their lives: hold on. Zola and the angel are about to collide. Figs start flying, dogs start arfing, and the whole village begins to WAKE UP. Zola is a girl with a mission. And our angel has been without one—till now. I started this book yesterday and finished it today (it is only 136 pages). I love it! One of the best things about this book is the angel's distinctive voice. She/he often mixes up words with others (but it isn't confusing) or combines them (which the author has an anecdote about here under the "Tidbits" on the side). This voice creates a character you can imagine in your head and allows for an interesting story. Both the angel and Zola are great characters, with the angel's combination of calm and agitation contrasting (or, if not, creating arguments) with Zola's energy. The book's setting is beautiful and creates a great story you can imagine in your head, with beautiful mountains and nature, as well as the villagers, mainly older people who stayed behind when their kids left (such as Signora Divino, who the angel often watches over, in a sense). One major conflict in the book is a group of homeless children who are not legally allowed in the country (creating great parallels to today). Zola, with the help of the angel, helps the kids, adding more depth to the story. This is a beautiful book that should be recognized and read by everyone! For Poetry Sunday, I am recommending "The Apology" by Lee Upton. I hope you enjoy it! 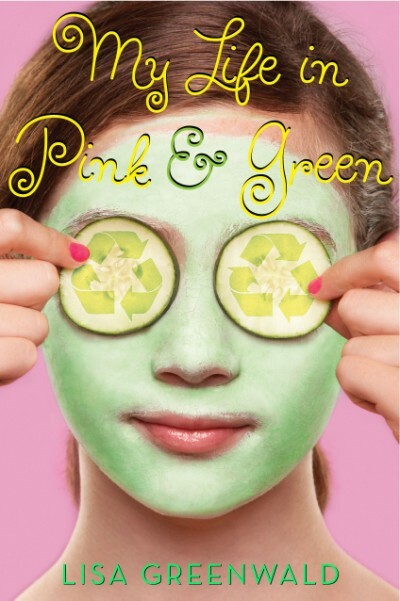 For MMGM, I am recommending My Life in Pink & Green by Lisa Greenwald. Twelve-year-old Lucy Desberg is a natural problem-solver. At her family’s struggling pharmacy, she has a line of makeover customers for every school dance and bat mitzvah. But all the makeup tips in the world won’t help save the business. If only she could find a way to make it the center of town again—a place where people want to spend time, like in the old days. Lucy dreams up a solution that could resuscitate the family business and help the environment, too. But will Lucy’s family stop fighting long enough to listen to a seventh-grader? Sometimes you just need a book that has substance, but isn't depressing. This is one of them! The main character, Lucy, lives with her mother and grandmother, who run a dying pharmacy. One of the themes in the book (and its sequels) is how adults often treat kids as being unable to do much. In the book, Lucy figures out a solution and tries to make it possible, with only the help of her college-age sister. Other themes in the book include the use of makeup to gain confidence and the importance of keeping the earth healthy. Although this book may seem to have many loose ends, they are tied together masterfully. The main character, Lucy, is very likable, being kind, motivated, and realistic. To distract from the main conflict, Lucy also has to deal with her friends and a new crush. This book is a great read that anyone will enjoy! Poetry Sunday (2/5/2017): Double Recommendation! For Poetry Sunday, I am recommending TWO POEMS! The first is "The Sadness of Clothes" by Emily Fragos, and the second is "Self-Portrait on the Street of an Unnamed Foreign City" by Jennifer Grotz. I hope you enjoy them! Click above for the new home of MMGM, Always in the Middle!